How Do You Know it’s Time for a Hearing Aid? How do you know it’s time for a hearing aid? If somebody asks you that question and your response is, “What?” then it’s probably a good indication that you could use a little help with your hearing. Unfortunately, for the 48 million people in El Paso and throughout the country experiencing hearing loss, the answer isn’t always so obvious. 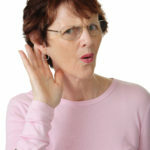 Hearing loss develops gradually, and many don’t even realize they have a problem until somebody else – usually an exasperated family member or friend – clues them in. You might think it’s easy to tell when you have hearing loss, but this is not always the case. The reason? With changes to your hearing happening little by little, your brain learns to adapt. High frequencies are typically affected first; when you suffer hearing damage in this range, the part of your brain responsible for processing low frequency sounds will try to compensate for this by taking on additional functions. The same holds true when hearing loss affects one ear. But it’s important to note that this does not “fix” the hearing loss – it only makes it less noticeable, which can actually cause more damage in the long run. The hearing loss still needs to be treated. Being aware of the signs of hearing loss can help you detect it sooner and improve the odds of successfully treating it. You experience tinnitus (ringing in your ears). Others complain that you are watching TV or listening to music too loudly. You are unable to hear everyday household sounds (e.g., ringing doorbell). You have trouble following conversations in a large group setting, especially when background noise is present. You have difficulty hearing when you are not facing the speaker. You have trouble understanding every word in a conversation. Telephone conversations are difficult for you to follow. Others accuse you of speaking too loudly. The treatment solution for hearing loss depends on the type of loss and its degree of severity. Hearing loss is classified as either conductive (resulting from damage to the outer or middle ear) or sensorineural (damage to the inner ear). Conductive hearing loss is often reversible and may be treated with surgery or medication. Unfortunately, sensorineural hearing loss is permanent – and by far the most common type. If you’re a Texan with hearing loss, there is a 90 percent chance it’s sensorineural in nature. The good news? This type of hearing loss usually responds very well to treatment with hearing aids. Your El Paso audiologist is the most qualified person to determine whether you have hearing loss and to prescribe an appropriate treatment solution. If you or somebody you know suspects you’re experiencing impaired hearing, make an appointment today.